It’s easy to ignore or distract yourself from feelings of discontent, to think that everything that’s wrong in your life is because of someone or something else, to believe it would be too hard to actually change your life. The diversions and excuses are all there, as well as the patterns of thinking that are preventing you from living the life you’re meant to live. The truth is, your life is determined by you, no one else, and this is good news! The way to make positive changes in your life is to truly choose to do so for yourself over and over. There are indications a need for change, which is an opportunity for growth, is building and inevitable. If you recognize 3 or more of these in your life, it’s time to do some inner work. First, I want you to know I’m a firm believer that nothing is wrong with you. Discontent with life is simply a sign of waking up to the gap between your reality and your potential. But rather than ignoring it or victim-playing or feeling overwhelmed or helpless, try viewing life as if it’s calling you to stand up and take notice. Because once you begin to awaken this new sense of connectedness within yourself, even by acknowledging the signs on this list, there’s no turning back. You may experience resistance, like, if while hearing or reading this list, you think, “Yes, but…” or you make excuses, it will be harder to move forward unless you’re honest with yourself. You are perpetually low on energy. If you wake up tired but still find it hard to sleep and feel like you’re running on empty, you may be living without a connection to your life’s deeper meaning. It could also be a physical issue, so please get a thorough check-up. You feel numb or like you’re just going through the motions in your life. When was the last time you laughed out loud? Or felt really passionate about something. If it’s been a while, you’ve stopped letting yourself feel, which is a sure sign of being separated from your purpose. You’ve developed a compulsive behavior. Whether it’s eating, drinking, smoking, nail-biting, NetFlix binging, cleaning, or something else, compulsive behavior is a clear indication you’re battling consciously or subconsciously within your heart and mind. When you get frustrated by minor inconveniences, aggravated by others, or think life is easier for everyone else, you’re avoiding your own issues by projecting. What annoys you or you judge or envy in others is often what’s out of harmony within. You can’t sit still and/or avoid downtime. Doing nothing makes hearing your inner voice unavoidable, so if you feel restless or antsy when you’re not distracting yourself with something, it’s a sign there’s insight within you about a need for change that wants to be acknowledged. This is a feeling of disappointment that’s an indication there’s unfulfilled potential, that you don’t feel like you’re living your true purpose, and that you’re avoiding your own growth by dwelling on sadness and regret. You’re waiting for something to happen. It may be waiting for the end of the day or the right time, or when you have more money, or when you’re ready, or when this or that other thing happens, but it’s all putting off your fulfillment for something else you’re making more important. 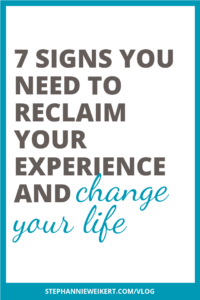 So what if several of these signs that you need to reclaim your experience and change your life are true for you? There are only 2 options: change or stay the same. If you choose to keep doing what you’re doing, you will get to the point where your discontent is too painful to ignore. But it does not have to get to that. It also does not have to be hard to begin to change your life. In fact, it can be surprisingly simple. Have you ever seen a movie where time travel is part of the plot? Usually one or more of the characters are afraid of traveling back in time and that any small change will alter the trajectory of everything. What if you apply that to the future. What if changing one small thing about your routine now, will transform your entire life? That was my experience. You can hear about the small change in my life that changed everything for the better in the Simple Yoga Life episode 3 Things You Must Believe To Create The Life You Want. In the years I’ve been a Certified Yoga Therapist I’ve discovered that the more concise your small change is, the bigger and more positive the benefits in your life. And that’s exactly why I created Shift Happens with Yoga to give you the exact tools you need to make one small change that will change your entire life for the better. It’s as simple as a customized therapeutic yoga practice and step-by-step instructions to make it a habit that lasts. If you know in your heart it’s time to make a change in your life, you can learn more about Shift Happens with Yoga go to stephannieweikert.com/shifthappens. If some of the things on this list resonate with you, I want to encourage you to explore why you might want to make a change. A simple way to get clear about your motivation and gain enthusiasm for reclaiming your experience and changing your life is to use “so that” statements. Start with “I want to make a change in my life so that…” What? And then keep drilling down until you realize a deeper reason to make a change. Here’s an example from my life. A number of years ago, I wanted to shift some things in my life. As I often do, I turned to yoga. and decided to commit to 3 classes per week but needed to attend 6:30 AM classes to make that work. I go to bed early so that I will be able to go to an early yoga class. I go to an early class so that I will be able to make time for more yoga consistently every week. I consistently practice yoga so that I will feel good in my body and have a calm mind. I want to feel good in my body and have a calm mind so that I can be happy and at peace. So knowing the reason I want to go to bed early is so that I can be happy and at peace, makes going to bed early a much easier choice. If you are perpetually low on energy, feel numb or like you’re just going through the motions in your life, have a compulsive behavior, bothered by small things, can’t sit still and/or avoid downtime, wonder if “this is it” about your life, or are delaying you fulfillment by waiting for something else to happen first, it’s time to have an honest look at things. Take time right now to use “so that” statements to uncover why you might be ready to reclaim your experience and make a simple change in your life that will change everything. Let me know in the comments below why you might be ready to make a change by finishing the sentence: I want to make a change in my life so that ___ ? If you’re a fan, like and subscribe.